In a time of vast changes in healthcare, Creative Health Care Management is embracing Appreciative Inquiry and positive organization development to inspire healthcare leaders to new possibilities. It’s no surprise that healthcare is facing vast, systemic changes. The industry itself is transitioning from a business of fee for service to population and preventative health management, and with that shift are challenges across all levels of operations. Healthcare leaders who are looking to create a positive organizational culture turn to CHCM. The organization strives to help hospitals and other health care organizations develop their people and redesign their systems to be consistent with their own stated values. The organization is partnering with David Cooperrider, PhD, Fairmount Santrol - David L. Cooperrider Professor in Appreciative Inquiry and professor of organizational behavior at Weatherhead School of Management, to elevate the importance of relational connection in healthcare at the International Relationship-Based Care Symposium in 2017. Cooperrider is encouraging CHCM to demonstrate more broadly the power of compassion and love in healthcare for healing and wellbeing. “He challenged us to go beyond innovations to strengthen daily operations and think about creating a movement,” says Ann Flanagan Petry, a Class of 2016 alumna of the Master of Science in Positive Organization Development and Change at Weatherhead. Petry has served with CHCM for just over a year and a half. She says the company embodies the work of positive organization development. The members of CHCM embody the same principles within the organization that they demonstrate with their clients. “I never expected to be positioned where I could touch people all across the world while also being able to live and work and lead in an organization whose vision is to practice what we teach,” says Koloroutis, who has served with CHCM since 2000. CHCM is committed to a shared leadership model, operating with a board, two executive leaders, a financial officer, and a CEO. Self-directed teams made up of members within the organization advance innovation in products and services, operational effectiveness research and internal development. “Up until three years ago, the team in the office had a supervisor who monitored and directed daily work. When that position was eliminated, the office team designed a beautiful framework for a self-directed system that has resulted in increased efficiency and creativity.” People have stepped up and into capacities that exceeded expectations. CHCM is committed to practicing the acronym “ACT”: High Accountability, High Commitment, and High Trust. By communicating who is leading and creating a mechanism for resolving conflict within teams, the organization develops a free and productive way of working. Because the organization is a virtual company, with six individuals in the Minneapolis corporate headquarters and the rest of the 30+ staff all over the country, communication is a key ingredient to the organization’s success. The company’s monthly open telephone meetings and twice-annual retreats are a vital component to their success. These outlets provide a forum for everyone to meet and speak for the advancement of each other and the organization. Although it’s rare, if a problem occurs in the field or within the organization, Koloroutis knows she must act quickly, because toxicity erodes morale and overall effectiveness. In this way, hiring for fit for both role responsibilities and culture is vital. Koloroutis wants people to see CHCM as an example of a for-profit company doing well by doing good. CHCM proves that a strengths-based management approach succeeds both financially and by making a real difference in the world. Do you have a story about an organization that is changing the world? Share it with us! 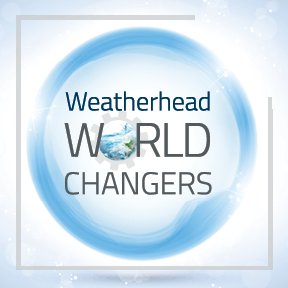 Learn more about what it means to be a Weatherhead World Changer. Explore how Weatherhead’s degree programs can help you change the world through design, innovation, and positive organization development.